Homemade marshmallow is without a doubt one of the most delicious things in the world. Unlike the marshmallows you pick up in a bag at the supermarket, homemade marshmallows are the most flavoursome, pillowy bite-sized treats you’ll ever try. Unfortunately homemade marshmallow is one of those things many home-bakers shy away from. I get it, it all seems a bit intimidating knowing you have to boil sugar syrup and use a sugar thermometer! But it’s actually really, really simple – all you need is a little bit of time. 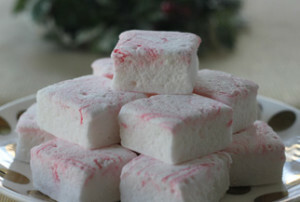 If you haven’t tried making your own marshmallow, then Christmas is a great time to start. Not only does it taste amazing, but it’s a great ‘make-ahead’ gift – simply pop the finished marshmallow in an airtight container and you can safely store it for a couple of weeks. If it lasts that long, that is! This peppermint marshmallow makes a fabulous Christmassy treat – flavoured with just the right amount of peppermint and marbled with red food colouring, this is one gift your friends and family will absolutely love unwrapping on Christmas day. Simply bundle up in wax paper or an airtight container and wrap with your favourite gift wrap for the perfect Christmas gift. Make sure to save some for yourself though – it looks gorgeous piled up in a pretty little bowl like this one. Grease and line a 40cm x 30cm rectangular tray with baking paper. Lightly spray top of baking paper with non-stick spray.